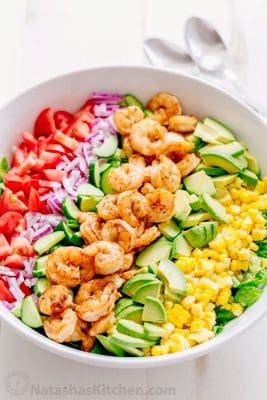 This shrimp avocado salad has all of the best flavors of summer. Loaded with avocado, cucumbers, tomatoes and corn all over a bed of bright romaine with a light cilantro dressing. Place shrimp medium bowl, sprinkle with 1 tsp cajun spice, 2 pressed garlic cloves and a pinch of salt and stir to combine. Heat large non-stick pan over medium high heat. Swirl in 2 Tbsp butter. Once butter stops sizzling, add shrimp in a single layer and sauté about 2 min without disturbing. Flip shrimp over and sauté another minute or just until cooked through. Don't overcook shrimp or they can become rubbery. Remove to a plate and set aside to cool. Chop, rinse and spin dry romaine lettuce. Line the bottom of a large salad platter/bowl with 5 to 6 cups of chopped romaine lettuce. Add remaining salad ingredients and shrimp in rows on top of romaine. To make the dressing, in a small bowl, whisk together dressing ingredients. Drizzle dressing over the salad then toss to combine and serve.